One of three apartments I called home during my years of teaching English in China was a 6th floor walk-up with a tiny, glass-enclosed balcony kitchen that was maybe 6 feet long and 4 feet wide. In the winter, that kitchen became so cold that an icicle dripped from the faucet Christmas morning. I moved in on a sweltering summer day, though, and the first thing I discovered was a colony of ants living in the refrigerator, feasting on the bread and grapes that a representative from the school had kindly left for me as a welcome gift. After climbing those stairs several times a day, besides walking to and from the bus stop, as well as several miles more miles to get from the bus stop to the school, I certainly felt like I'd earned my dinner. Sadly, though, I had no oven for baking, and barely knew how to cook, so breakfast was rarely more than a cup of instant coffee, sweetened boxed milk (which was not real milk, although I'm not sure what it actually was since it didn't require refrigeration) and a packet of crackers, with dinners usually consisting of canned tuna, fruit, and instant noodles, with the occasional pot of vegetable soup to get me through the week during the colder months. Lunches out with students or coworkers were always the best meal of the day, some of my favorites being spicy chicken and peanuts with rice, garlicky wok-fried snow peas, or a bowl of potatoes, beef and rice smothered in a fragrant curry sauce. I wish I'd taken a few photos of that apartment, but that second year was a lonely one for me, and not one that I wanted to document at the time, so I only have the images that I can remember, and the feelings that still linger 12 years later. Fortunately for my husband, I started learning how to cook a bit better in my late 20s, so that by the time we met when I was 30, I wasn't half bad and could at least present him with a few decent meals when it was my turn to grocery shop and cook. Still, though, I find dessert making and cake baking far more interesting and enjoyable than cooking dinner, but one can't live on cake. Last weekend, I was all about rewarding my husband and myself for some back-breaking yard work, so for our day off on Monday, after two hot days of weed-pulling and planting, we made pancakes for breakfast. 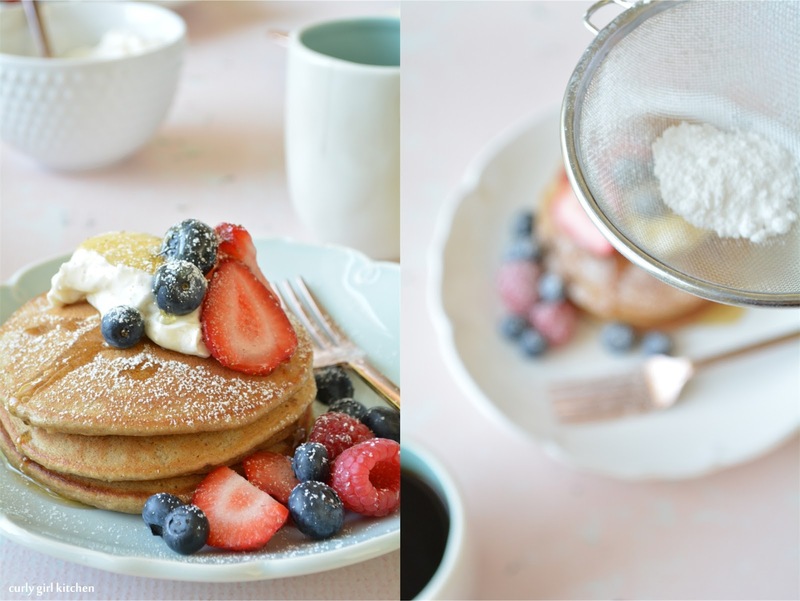 This is a wonderful, every-day pancake recipe, that's light and fluffy, but with a wholesome heartiness from the whole wheat flour. 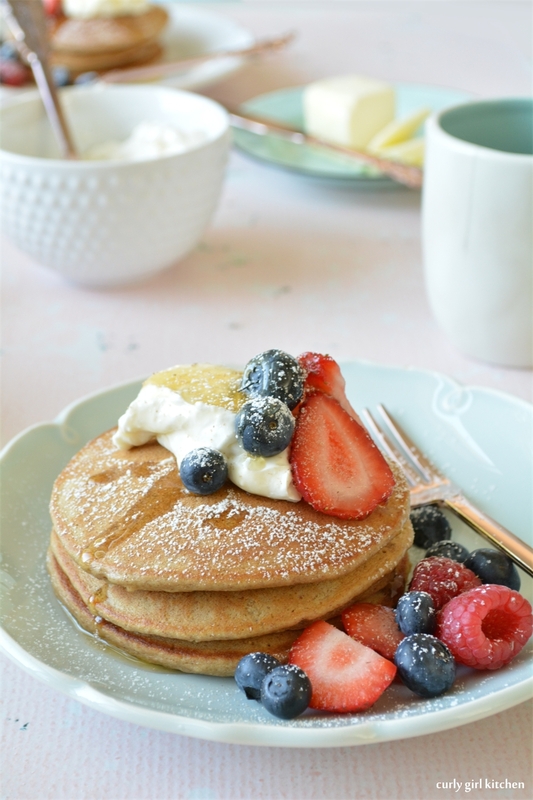 They're sweetened with bananas and raw honey, and instead of smothering them with syrup, I added a dollop of whipped cream cheese with fresh berries. In a blender, blend the pancake batter ingredients for 30 seconds. Heat a griddle to 275F, and spray with non-stick spray. Measure out 1/4 cup of batter per pancake and cook the pancakes until cooked on one side before flipping to cook the other side. 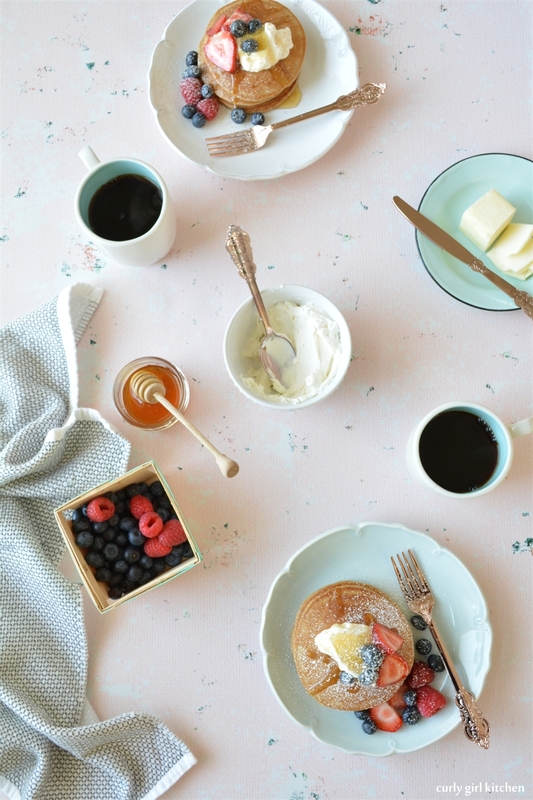 Whip the cream cheese with the honey and cream until smooth. 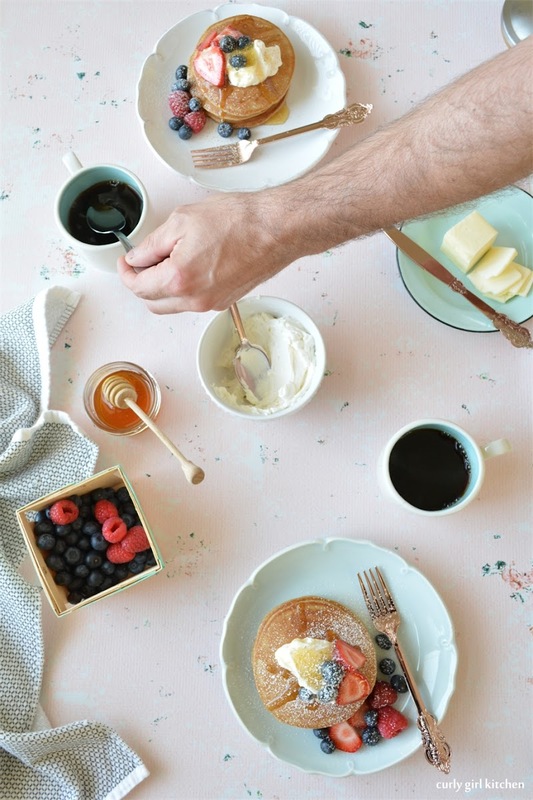 Garnish the pancakes with the whipped cream cheese, berries and powdered sugar.